Strong & Sturdy, this solid beech wood umbrella yarn swift is perfect accessory to hold a hank of yarn while it is being wound off. The ribs of the swift are riveted unlike most other umbrella swifts which makes it strong & sturdy. This classy Top Whorl Drop Spindle for hand spinning fibre is made of Indian Rose Wood with an exquisite pattern and is suitable for spinning a medium to thick yarn. 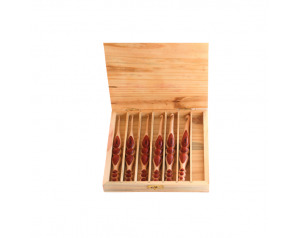 Set of 4 beautifully carved Single Pointed Crochet hooks set made from Indian Rose Wood. Each of the crochet hooks is approximately 6"(15 cm) long. This handy tool is used to make a square braid with a single strand of yarn. Wooden Yarn Bowl - 7" X 3"
Keep your yarn tangle free clean and organised with this exquisitely hand crafted and painted in zebra print design Wooden Yarn Bowl.